Author: Jules Mansaly. Series edited by: Wilhelm J.G. Möhlig. Proverbs are mirrors of the worldview that one has. This applies as well to the Balanta of Senegal, whose numerous proverbs reflect their cultural ideology and world of thought. Proverbs convey a philosophy – ways of thinking, understanding and living. They consolidate and reinforce the social facts, beliefs and practices of the society they emanate from. It is the culture, the tradition of a people that appears at the sur­face again and again through the grammatical structure and stylistic devices. Nonetheless, pro­verbial expressions are above all linguistic facts. Thus, the author of the present book set out on the endeavour of providing a holistic account when collecting, translating and commenting on the proverbs of the Balanta. His work therefore is dedicated to a wider public: it shall serve as a tool for speakers of the Balanta language as well as for interested outsiders, for general linguists and for those with specialized knowledge in the area of the Balanta language and culture – and for any curious person. The collection is aimed at contributing to the analysis and deeper understanding of proverbs and to the documentation of the Balanta language. Not least, it seeks to preserve these treasures of orality for future generations at the very moment where they are in danger of falling into oblivion through processes of urbanization, modernization and scolarization that value written culture and perceive it as rational, whereas “traditional” practices are rather disparaged. A short introduction by the author is followed by the collection of 535 Balanta proverbs which are arranged into thematic categories, each with its interlinear morpheme gloss and French trans­lation. In addition, further explanations on the meaning of the proverbs as well as comments on their usage are included. By the same author a dictionary of Balanta-Ganja has been published, see link at the bottom. Le proverbe est le reflet de la vision que l'on a de son monde. C'est bien le cas du balant (du Sénégal) dont beaucoup de proverbes reflètent son idéologie ainsi que sa pensée. Le proverbe véhicule une philosophie, les manières de penser, de comprendre la vie. Il vient consolider et renforcer les faits sociaux, les croyances et les pratiques de cette société dont il est issu. Car, à travers sa structure grammaticale et les figures de style employées dans lesquels se coulent des structures d'image qu'on retrouve dans les différents thèmes, c'est la culture, la tradition d'un peuple que l'on voit et revoit. 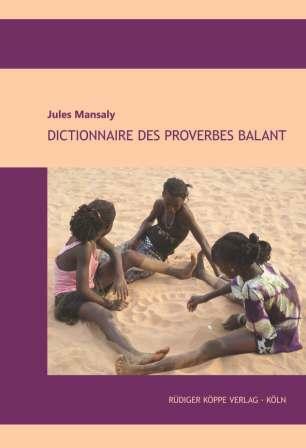 C'est d'ailleurs l'une des raisons pour lesquelles l'auteur de ce livre a entrepris une démarche holistique pourtant fonda­mentale pour la collecte, la traduction, et l'analyse de ces proverbes, puisqu'ils sont avant tout, ces proverbes, des faits linguistiques. L'ouvrage est donc destiné à un large public : il est un outil de travail destiné au locuteur balant ou au curieux, au chercheur linguiste ou au spécialiste de la langue et de la culture balant. Cette collecte a pour but de contribuer à l'analyse et à une compréhension plus approfondie des proverbes, et à la documentation du balant comme langue. Elle cherche notamment à préserver et à transmettre aux générations futures ces trésors de l'oralité au moment où ce savoir tend à se perdre avec les mouvements d'urbanisation, de modernisation, de scolarisation qui valorisent la culture écrite dite rationalisée et coupée des croyances et pratiques « traditionnelles » souvent dénigrées. Après une brève introduction, l'auteur procède à une classification thématique des 535 énoncés proverbiaux, selon l'ordre alphabétique, en français. Pour chaque proverbe, il y a une glose inter­linéaire des morphèmes ; il y a également des explications des sens (sens littérale et vrai sens) des proverbes et des commentaires quant à leur utilisation.